Signed by Pat Stanton on the 15th August 1981 in an exchange deal with Craig McFarlane from Cowdenbeith. Having been signed by Edna Hibs after scoring 36 goals in a season, originally tipped to be a prolific goal scorer. He made his Dunfermline debut only a few weeks later when Stanton called him in for the Ayr game on the 24th October. Norrie turned in a solid debut performance, to the delight of Pars fans. against Queen of the South. The Arrival of Tom Forsyth saw Norrie drop to the bench for season 1982/3, in the season where he gained a few games, which also saw the pars relegated. 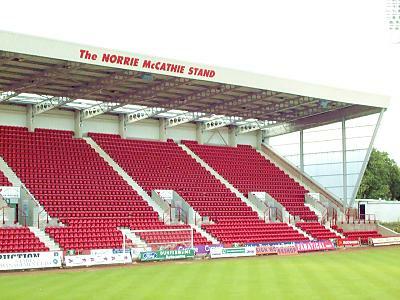 The Norrie McCathie Stand, named after the inspirational Pars captain who tragically died on 8th January 1996. Home fans occupy this, the town end of the ground. Changing rooms are located under this stand and the players emerge from a tunnel in the bottom left hand corner. 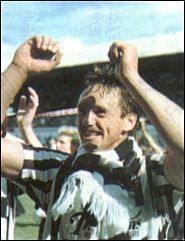 In 1984 Norrie returned as a strong centre half for Dunfermline, and became an automatic first team selection. In February 1984 McCathie played one of his finest games for the Pars, against League Leaders Alloa. It saw the Pars 3-1 winners. Winning the 2nd division in 1985/6 season, then gaining promotion into the premier league all came fast for the Pars centre half. He had shown drive and inspiration through the years, and could only improve. He gained a pre season injury in season 1989, which saw his Dunfermline career in doubt and was given a loan deal with Ayr, but returned for a vital match in January against Airdrie scoring the second goal of that game. It was his proudest moment, to be back with the Pars. He went on not to miss a league game for 2 seasons, putting Dunfermline into the league cup final of 1991, only to be beat by a strong Hibs team. Norrie sadly died on the 8th of January 1996, playing his last game in a 2-1 defeat at St. Mirren two days beforehand. The devastated Pars team went on that season to win the league title, after not being the press favourites, they defied all the critics and done it for MR DUNFERMLINE. Norrie holds the record for most league appearances for Dunfermline with 497 (563 in all competitions) scoring also 54 league goals (59 in all competitions) for the club. The spirit of the man still lives on at East End Park. He is always in our thoughts. In a fitting tribute in December 1998 the Stand behind the home goals, was named after him, to one of Dunfermline Athletic`s Greatest Hero`s.